So as you know, I enjoy operating HF portable, and to do that I use my rugged build Yaesu FT-897D with its internal batteries, and my 10-60 meter vertical antenna that I designed and built especially for the 897. Now I have employed different methods of packing my kit with me, but I am always on the look-out for other ways of carrying my gear, depending on what I have in mind on any given day. Over the last while I had been on the lookout for a padded over the shoulder bag for my 897, and I found the perfect bag built by 'Think Tank', the company whose bags I use for carrying and protecting my camera gear. I found that the Think Tank "Urban Disguise 35" is perfect, as the 897 fits in this bag as though Yaesu had commissioned Think Tank to build this bag for the 897. This bag also has a optional backpack harness available (I have it), and the harness may be installed in seconds if one wishes to move the 897 to the back. 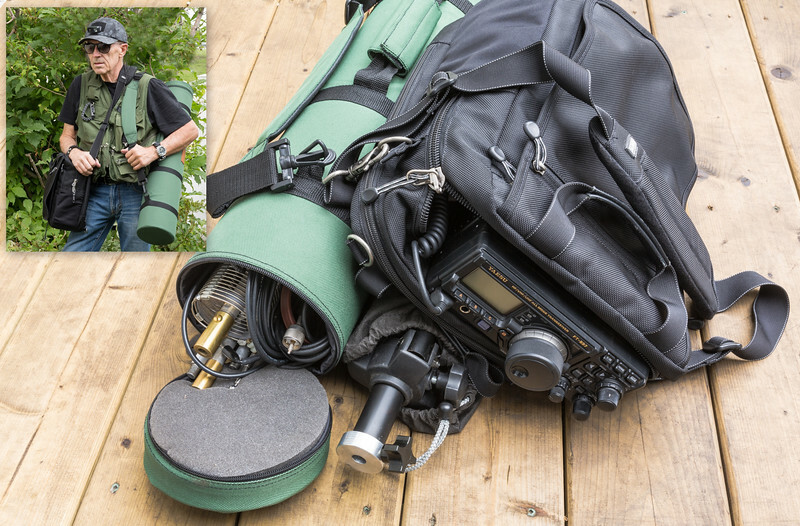 With that handled, I was also on the lookout for a over-the-shoulder bag for my antenna system, consisting of my 10-60 meter vertical with its assorted accessories, a roll up VHF/UHF 2 meter vertical, lengths of coax for both antennas (the 897 all mode radio has two antenna connectors). As seen in the photo I found the perfect carrying case at Cabela's in the form of a 6" X 30" Cordoba covered hard case with a internal liner and zippered cover to access the antennas. Also visible is an MFJ tripod that I use when I want to quickly deploy the antenna. I have several of these MFJ tripods, and as built, they leave a lot to be desired. Too improve on them, I made a number of modifications to them in my shop that includes cutting down the center section and discarding the telescopic pole and plastic mounting hardware. I then make up a new adapter for the top of the tripod as shown, that allows the 10-60 meter vertical antenna to be attached to the tripod. I also made up inserts for the legs of the tripod that allows for leveling off the tripod on uneven ground, therefore allowing the antenna to stand straight. I also installed metal eyelets on all 3 legs (at the foot of each), allowing the tripod to be anchored to the ground in necessary due to the wind blowing or what not. I also installed a grounding lug at the bottom of the center column for attaching the antenna ground radials to the tripod. Now If I wish, the antenna may be used without the tripod, but the tripod certainly quickens the setup time if time is of the essence. Since acquiring and making the necessary modifications required to the gear as shown and described, I have been in the field with my portable station, and I am pleased with how everything has worked out.